Some quick pics from yesterday for you. 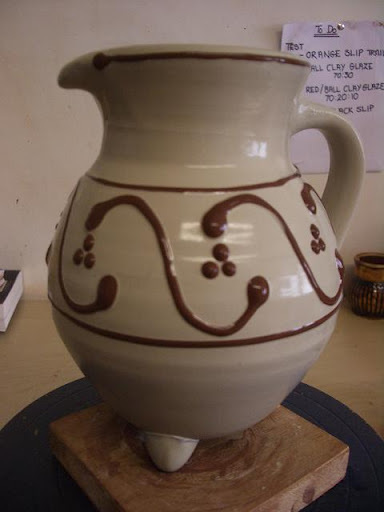 I had a half dozen or so of these jugs with feet to slip, I liked them very much the last time I made them. I don’t think I’ve sold any yet but they make me chuckle so I thought I’d make some more. The first batch of unslipped ones are photographed in the May / June issue of Craft&Design Magazine. I’ve just received the second one with my article in it through the post this weekend. It’s exciting seeing it all in print again. The next deadline is a week tuesday, how on earth does it just keep coming around so soon? This afternoon I travelled over to Stranraer with Hazel to be at the opening of the Spring Fling Taster exhibition at Stranraer Museum. It was a great turn out over there, some people had come big distances to be there and be part of it. It was a very enjoyable afternoon and I was too busy chatting and catching up to take pictures of any of the work that was there. You will have to believe me when I say that there were some wonderful things on display. I’m not generally a jewellery type person but I was very taken with one of Natalie Vardey’s long necklaces with crochetted silver panels, the link takes you to the range that I was looking at. This evening I have finally finished getting together the next issue of the SPA newsletter, this one had to turn into a 16 page issue as I had so much to go in there, that’ll probably up the postage costs but never mind, there’s a lot of interesting things in there I think, I’ll get that in to the printers first thing monday morning. I unpacked a glaze kiln on friday, most of it an order to go to the Royal Exchange Craft Shop in Manchester, it’s a place I used to work at before I moved up here all those years ago now. They have ordered Birdie and Footprint pots, so they should be there by the end of the week. Let me know what you think if you happen to be passing the theatre there and have the chance to pop in. 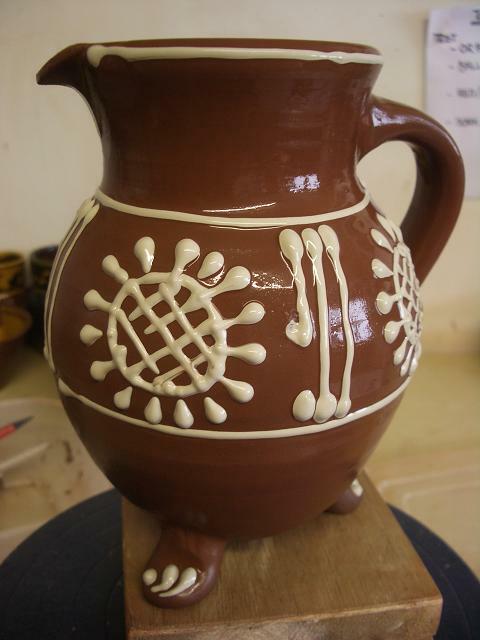 Tomorrow I think will be mostly spent at the workshop catching up on the things that I have been neglecting due to the attention I have been lavishing on my kiln. Hopefully the weather will stay this fabulous way that it has been for the last couple of weeks as I fancy a bit of a cycle in the afternoon all being well. Enjoy the rest of your weekend all, till next time, toodle pip. 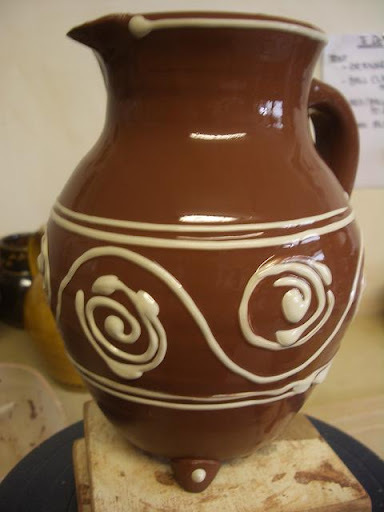 This entry was posted in Hazel Campbell, legged jugs, Royal Exchange Craft Shop, Spring Fling 2010, Stranraer Museum. Bookmark the permalink. Will u be entering the jugs 4 the 3 legged race???? 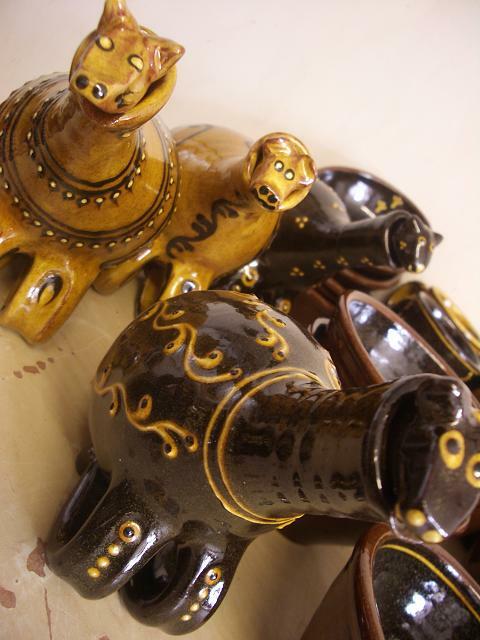 Will u b entering the jugs 4 the 3 legged race??? ?